Inner Child Cards is a tarot system that helps us interact with the world's most potent archetypes. The authors assign an archetypal childhood story to each image in the traditional tarot deck. Cinderella aligns with the Moon card, traditionally associated with the power of dreams and visions. Sleeping Beauty parallels the Death card with its theme of personal metamorphosis. Little Red Cap stands in for the Fool (the innocent). Before the Age of Reason higher learning was transmitted through archetypal characters in stories and fairy tales. In modern times these all-important stories have been relegated to a secondary position, with no recognition of their deeper meaning. The whimsical art and familiar characters of the Inner Child Cards will awaken dormant emotional memory that has been trapped in long-forgotten childhood stories. Tarot has always had an uncanny capacity to act as a "hall of mirrors" reflecting the true trajectory of life. 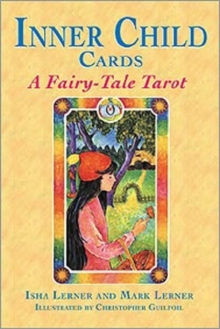 By referencing fairy-tale archetypes, Inner Child Cards gives adults an especially clear reflection of the child within and imaginative access to the soul's own personal truth. And because of their playful nature, these cards are equally well suited for use with children.